Buyong Hwang's 'The Dancers' series gives the impression of vivid colors and catchy lines of smooth and rhythmical strength based on descriptions of white silhouette. His works are footprints of a simple crystal. Viewers may feel as if they were watching thunder and lightning. It will take viewers a little bit of time to sort out their initial powerful impressions. Expressing the surging fortunes of life and the swelling of the liver, his works express human desires. As a symbol or a trademark, his works are not art for art's sake, but art focusing on humanity's everyday feelings. It is the purpose of the paintings to provide a sense of healing and belief in the emotions like talismans which is used to bring good fortune and prevent misfortune. Buyong Hwang's 'Resurrection' series are remakes of the works first released in 2010 and 2012. The silhouette technique of his healing graphism works do not use anything other than the subject. While the images are symbolic, they are as simple as a symbol or a trademark. A happy man is not without wounds, but a man can heal himself through many wounds. Hwang's healing graphism works are emotionally capable of supporting this belief. Everyone lives with a variety of problems that are not resolved in their minds, though problems may differ from one person to another. Physical wounds heal over time, but mental wounds persist. Wounds exist in the form of energy within our bodies. No matter how hard we try to get rid of them or deny them, they are hiding somewhere and, from time to time, appear seemingly out of nowhere. .....at the southeast edge of the Korean peninsula. .....Seoul Arts Center Design Gallery. .....The Art Gallery of Uzbekistan, Tashkent, Uzbekistan. 2019; Exhibition "A GIFT OF LOVE"
1976; Graphic designer, advertising agency Oricom, Inc.
1983-1987; Chief designer, Seoul Olympic Organizing Committee. 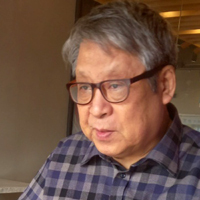 1988-1993; Principal of the design consultancy DesignBridge, Inc.
1995-1997; Visual editor, daily newspaper The Joong-Ang Ilbo. 2005-2006; Design Consultant, daily newspaper The Chosun Ilbo. .....33 year career in graphic design in Korea. 1987; Second prize, International Poster Salon, IAA, Paris, France. Copyright (C) 2010-2019. This website is copyrighted by Buyong Hwang. All rights reserved.